Newly redesigned, our Limited Edition sailing ship models of the famous America’s Cup challenger Endeavour feature significantly upgraded deck features and increased craftsmanship. Still actively sailing and racing today, Endeavour will take you away with the wind and waves in these Limited Edition model yachts. 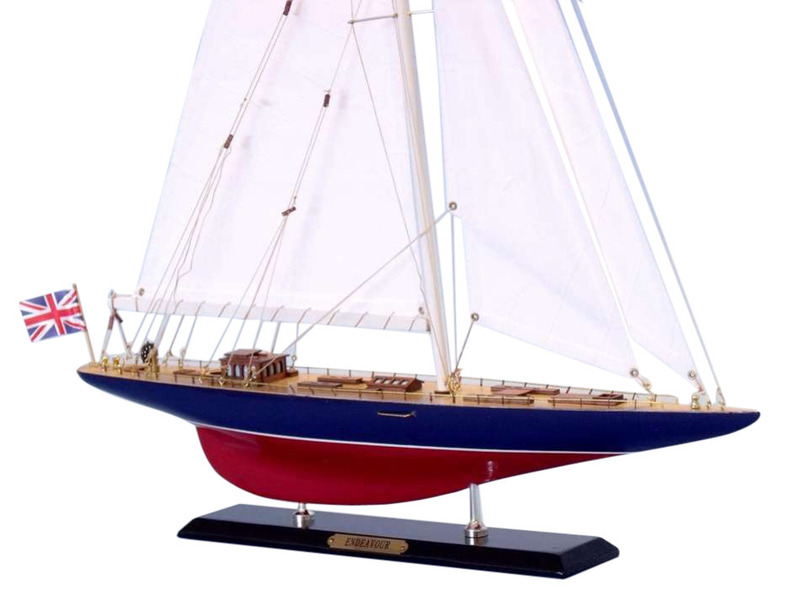 Perfectly sized for any bedroom shelf, sunroom mantle or office desk, this high-quality yacht model is adorned with finely-crafted features and graceful lines. Endeavour, a 130-foot J Class sloop, was commissioned by Sir T.O.M. Sopwith and built by Camper & Nicholson at Gosport England to challenge for the America's Cup in 1934. Having prepared his campaign in Shamrock V, Sopwith was keen to ensure that this yacht was the most advanced design possible. With his experience designing aircraft Sopwith applied aviation technology toEndeavour's rig and winches and spared nothing to make her the finest vessel of her day. From launching in 1934 shecontinued her preparation by competing against Shamrock V (then owned by Sir Richard Fairey) and the newly launched Velsheda (owned by W.L Stephenson). She swept through the British racing fleet and into the hearts of yachtsmen the world around, winning many races in her first season. Like many before her, Endeavour did not win the Cup but she came closer to doing so than any other challenger. Endeavour pioneered the development of the Quadrilateral genoa, a two clewed headsail offering immense sail area and power, and still used on J Class yachts racing today. She also had a larger and better designed spinnaker but Sopwith was let down by poor crewing. Just prior to departure for the USA, his professional crew went on strike for more money and Sopwith was forced to round up keen amateur sailors, who had the enthusiasm but not the experience. Afterwards, she returned to England to dominate the British racing scene until 1938 when she was laid up prior to the war. Over the next 46 years, Endeavour passed through many hands, her fate often hanging by a thread. Among other indignities, she was sold to a scrap merchant in 1947 only to be saved by another buyer hours before her demolition was due to begin. In the seventies, she sank in the Medina River in Cowes. Again at the eleventh hour, she was bought for ten pounds sterling by two carpenters who patched the holes in her hull with plastic bags and got her afloat again. In the early eighties, Endeavour sat in an abandoned seaplane base in southern England. She was a complete wreck, a rusting and forlorn hulk with no keel, rudder, ballast or interior. In 1984 American yachtswoman Elizabeth Meyer bought Endeavour and undertook a five year rebuild. Since the hull was too fragile to be moved and was miles away from any boatyard, Meyer had a building constructed over the boat and hired welders to restore the hull. Endeavour's missing keel and ballast were rebuilt, the steel frames and hull plating repaired and replaced where necessary, and a new rudder fabricated. The newly seaworthy hull was launched and towed to Holland where it was put on a barge and transported to the Royal Huisman Shipyard. 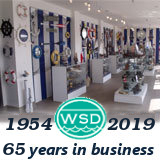 There, the mast, boom and rigging were designed and built, the engine, generator and mechanical systems installed and the interior joinery completed. All told, an inconceivable amount of work, love and agony went into achieving Endeavour's present level of perfection. Endeavour sailed again, on June 22, 1989, for the first time in 52 years. Between 1989 and 1999 Endeavour cruised extensively and competed in numerous races, creating a wonderful spectacle In April 1999, history repeated itself when she was joined by Shamrock V and Velsheda to compete in the Antigua Classics Regatta, bringing in a new era of J Class sailing a sight not seen in over 60 years. American, L. Dennis Kozlowski stated in 2000 "No one truly owns Endeavour, she's a part of yachting History, I'm delighted to be the current caretaker." Endeavour, Velsheda and Shamrock raced together at the J Class Regatta for the first time in UK waters after more than 65 years. Endeavour won both regattas after close racing between the yachts.